Plans to build an aquarium and children’s museum adjacent to each other in St. Augustine are moving forward. The coinciding projects of the Children’s Museum of St. Johns and the St. Augustine Aquarium are a public partnership with the City of St. Augustine. It is proposed for Riberia Pointe, with plans to open in 2015, in time for the 450th anniversary of the city’s founding. Projected to cost $6.3 million, the nonprofit museum will focus on interactive learning and play. It will highlight science, technology, engineering, art, math, history and culture. Update April 8, 2014: Matt Roy from Living Color Aquariums made an appearance on local Jacksonville station News 4 Jax in this interview. In addition, the state-of-the-art facility will feature indoor and outdoor exhibit space. It is expected to attract at least 85,000 visitors during its first year and pump at least $1.9 million annually into the economy, said Kim MacEwan, museum executive director. 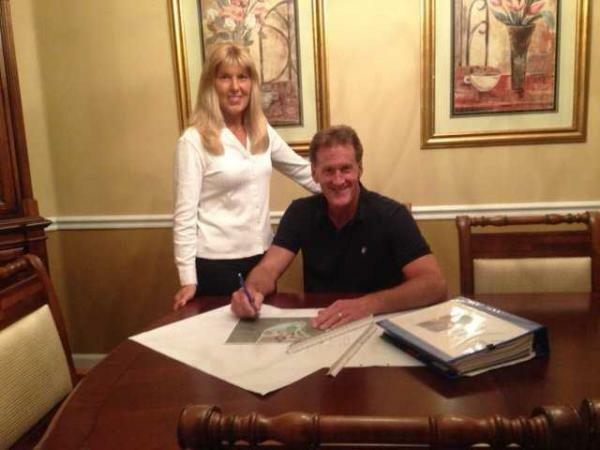 CONTRIBUTED (from left) Kathy Hiester (standing) and her husband Shawn Hiester of Marine Conservation Partners in St. Augustine are moving forward to develop a 250,000 gallon public aquarium plus a botanical garden and aviary project at Riberia Point in St. Augustine. 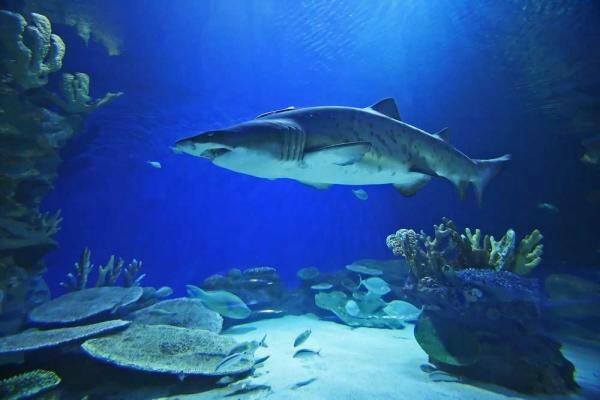 Among the marine animals planned for the aquarium will be a sand tiger shark. “We’re doing our design right now. We’re just about finished with the 3-D renderings, then we will break ground this year and build the museum,” said MacEwan, adding they expect to break ground in the spring, and open sometime in 2015 on 2.4 acres leased from the city. MacEwan said the goal is to create educational and interactive experiences for children and families which will inspire creativity and a lifelong love of learning. The museum’s mission “is to create a place for discovery and imagination, sparking a passion for innovation,” she said. Education, along with public awareness about marine life, also is the inspiration for the aquarium project, being led by Marine Conservation Partners of St. Augustine. The estimated $8 million project includes a 250,000-gallon, 43,000-square-foot aquarium as well as a botanical gardens and aviary. Shawn Hiester, Marine Conservation Partners founder, said they expect to break ground in June on the first phase that calls for 110,000 gallons of marine exhibits and 25,000 square feet of indoor and outdoor facilities. “We’re still about two weeks away from finalizing an overall master site plan,” said Hiester, noting they anticipate opening in February 2015. They are currently working through the permitting process, which is expected to continue for three months, said Hiester, a longtime scuba diver and a marine biology enthusiast. Museum and aquarium officials jointly approached the St. Augustine City Commission last year about locating their proposed facilities on the same piece of land. In October, the City Commission voted unanimously to reserve property in Riberia Pointe for one year for the two projects. The aquarium and children’s museum each paid a $5,000 refundable deposit to the city as part of similar agreements between the entities and the city, said Mark Knight, city planning and building director. The agreements gave the museum and aquarium one year to complete their individual business plans as well as related studies, design work and secure funding. In exchange, the city agreed not to seek any other tenants for the land during that due diligence period, Knight said. Knight said the property is zoned for government use. It would have to be rezoned if either the aquarium or museum want to buy the land. Although they are “wrestling a few final design changes to ground, the aquarium project is pretty much good to go,” Hiester said. The aquarium will be unique, he said, because it will focus on Florida ocean and reef fish species. Replicating a 16th-century shipwreck, the aquarium will house some maritime artifacts to highlight St. Augustine’s rich ocean environment and maritime history. “Our focus is on marine conservation through education and this aquarium is a great way to increase public interest and environmental awareness,” said Hiester, who along with his wife, Kathy, established Marine Conservation Partners. Kathy Hiester said they are building partnerships with area research and rescue programs to house rescued marine animals at the aquarium once it opens. They also want to provide space for those animals that cannot be returned to the wild, she said. Among the species planned for the facility are sand tiger sharks, bonnethead sharks, blacknose sharks and nurse sharks; barracuda, green moray eels, Atlantic octopus, Southern rays and grouper. They will use state-certified marine species collectors to stock the aquarium. They are seeking certification from the Association of Zoos and Aquariums, which sets standards relating to animal husbandry and sustainability, for their facility. “This is a way to bring marine life to land so that people who can’t go underwater and see them can learn all about the species,” said Kathy Hiester, who snorkels. The botanical gardens and aviary will feature tropical and subtropical trees, plants and birds in a natural estuary environment. There also will be interactive touch tanks with rays, sea stars and bamboo sharks at the aquarium, the couple said.